With the loss of many manufactured spending methods this year, many people are turning to resale to fill the void. Unfortunately, reselling has quite a bit more overhead than Serve does. After all, labels and boxes aren’t free… or are they? The three major US shipping companies, UPS, Fedex, and USPS, are very generous when it comes to packaging and shipping materials. I’m assuming their thought process is whichever company gives you everything you need to ship will likely get your business. Regardless, free is good and I’m glad they do it. If you use FBA, which I’m sure most of you do, UPS is, by far, the best company to ship with. The reason for that is simple: Amazon and UPS do such a large volume of business together, that shipping to an Amazon fulfillment center is a fraction of what UPS would charge you to ship somewhere else. You can use other shipping companies with FBA, but it rarely makes cents (pun intended). 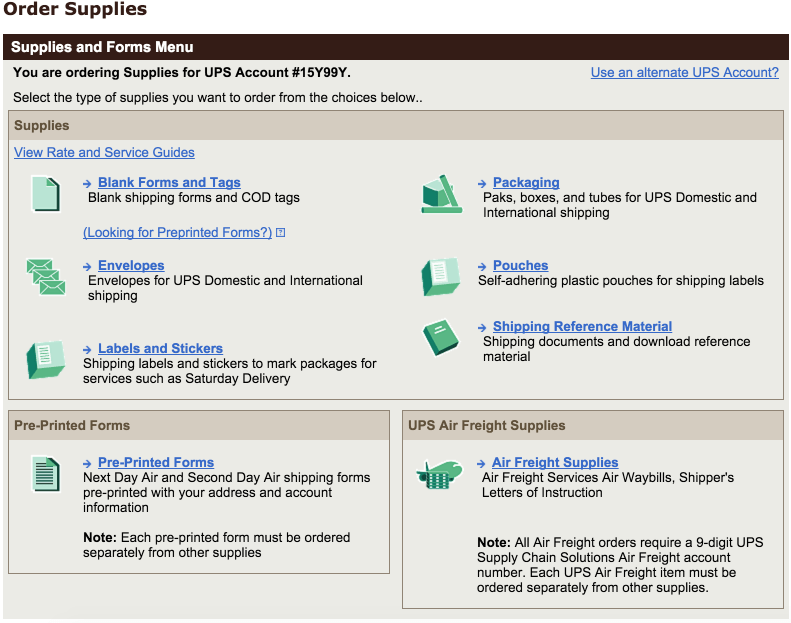 To “buy” free UPS shipping supplies, simply go to UPS.com, login, and select what items you need. 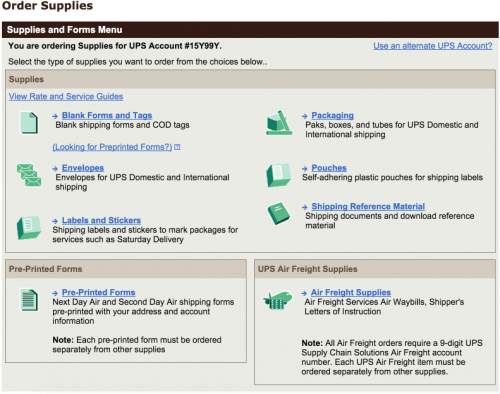 You need to have a UPS account to get free UPS supplies, but you can sign up for free here. Look at all the free UPS supplies you can get for free! 320 – 4″ x 6″ thermal labels in a roll. These are useful for thermal printers like the Zebra TLP 2844 or the DYMO LabelWriter 4XL (Disclaimer: Those are affiliate links). This roll won’t fit inside the printer, but you can feed the labels through the back. The beautiful thing is that you can print for free since you get the labels for free and you don’t need ink. 940 – 4″ x 6″ thermal labels in a roll. These are the same as the previous thermal labels, but significantly more of them. 50 – 2 label peel and stick labels (5.5″ x 8″). These are my go to for printing Amazon shipping labels and FBA tags. These sheets measure 8.5″ x 11,” so they can fit in standard laser and inkjet printers with no issues. 50 – 6.5″ x 10″ Address Pouches. These pouches can fit a normal 5.5″ x 8″ sheet of paper. If you don’t use the peel and stick labels mentioned above and instead just print on normal sheets of paper (then cut them in half), these pouches can hold those labels. The whole backside is sticky for easy attachment to your boxes. FedEx is an oddity to me. I rarely receive orders through Fedex and when I do it’s usually on a Saturday, which is a day that UPS doesn’t deliver in my area. Not only that, but I never ship Fedex either. 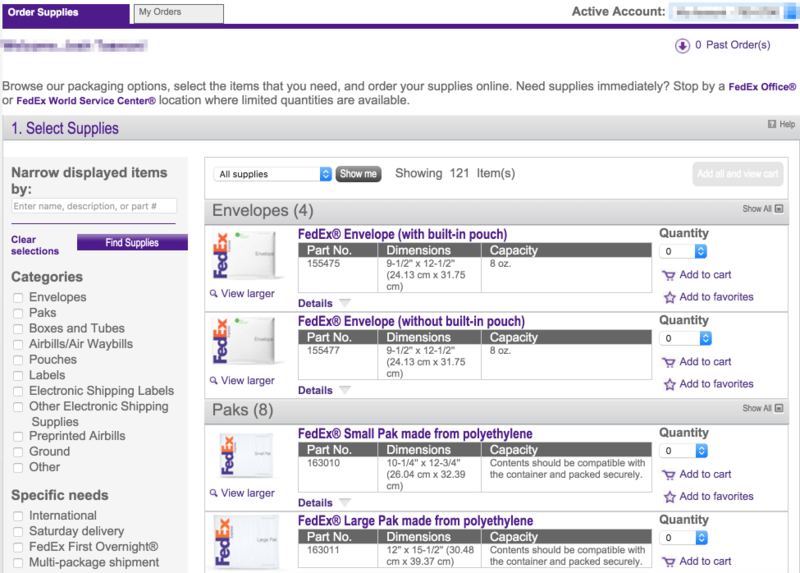 Seriously, I don’t think I’ve ever shipped a product via Fedex, but someone must… right? Otherwise, how would they stay in business? Regardless, they give free shipping products away as well, just like UPS and USPS, and it never hurts to have options. To order free supplies from Fedex, head to their online store. You will need a Fedex login, but you can sign-up for free here, if you don’t already have an account. FedEx Offers a lot of supplies for free. 200-2000 – Laser Labels (5.5″ x 8″). These labels are exactly the same as the peel and stick labels that UPS offers, besides the fact that they have Fedex branding on them. 300-3000 – 5″ Thermal Labels. – Again, these are the same style of labels that UPS offers. 50-500 – International Thermal Label Pouches – By now I’m sure you can guess, these are the same pouches UPS offers. The advantage of getting them from Fedex, is the quantity you can order at one time. USPS has a leg up on Fedex and UPS because they offer free boxes for many types of shipping, not only for express shipments. If you sell on eBay, then I’m sure you know just how advantageous this can be. What USPS doesn’t offer that the other two do, is free shipping labels. No company is perfect, I suppose. 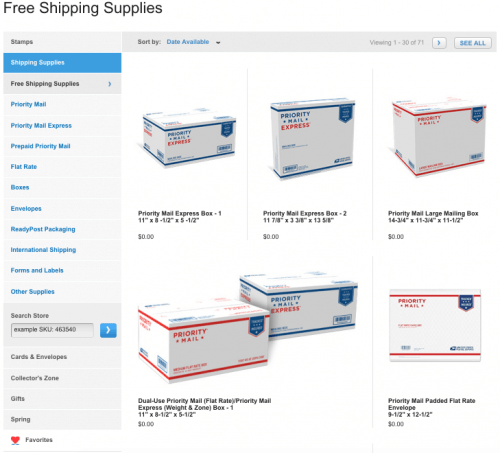 To get free USPS supplies, simply head to USPS’s website and select the items you need. Again, you will need an account to order free supplies, but that’s free as well. Free USPS supplies come in all shapes and sizes. Pretty much every kind. I would suggest getting some Regional A, B, and C as well as standard Priority and flat rate boxes. All of them come in handy at some point or another when shipping via USPS. Custom Form Envelopes. These are similar to the pouches that Fedex and UPS offer, but they can larger pieces of paper (almost a full size 8.5″ x 11″ piece). All Envelopes. USPS offers padded, flat rate, and standard priority labels. You might as well pick up all of them if you ship items in envelopes often. As I mentioned above, if you use FBA, you’re more than likely going to utilize the free supplies UPS offers. That being said, it’s still very nice to have free products available from Fedex and USPS when you have to ship out eBay products and other items. 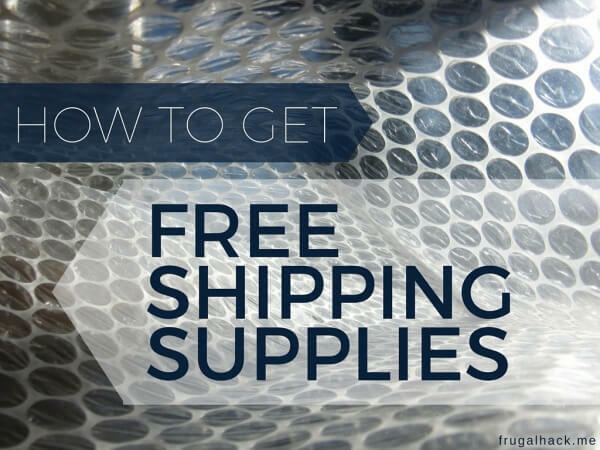 After all, free shipping materials greatly help your bottom line!